Ahh, just looking at that picture makes me relax a little. We often use sensory play as a lovely way to chill out after school, or to transition from a busy day towards bedtime. 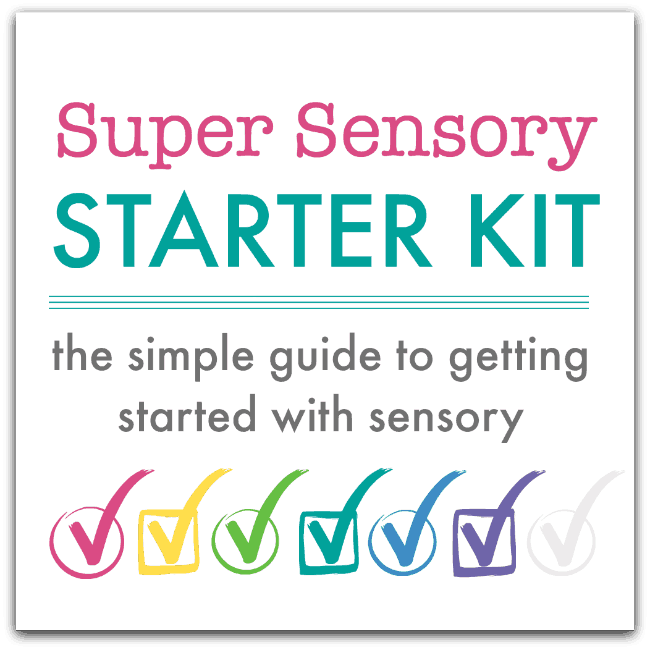 Tired children sometimes need a little direction and sensory play offers an activity idea that’s interesting but also calming and relaxing. Play dough is our favourite choice for sensory play but today we tried something different: lavender dyed rice. It’s touchy-feely and smells wonderful – perfect for chilled out kids. 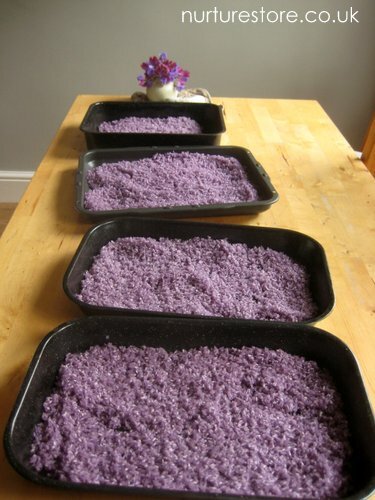 Here’s how to dye rice and make a bedtime sensory tub. 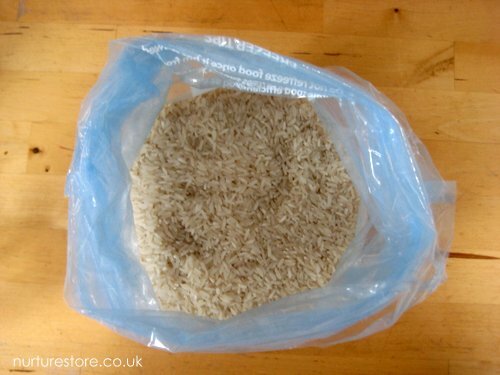 Start by placing your uncooked rice in a plastic bag – double bag as a precaution against tears and spills! Then mix up your colour. I blended blue and pink food colouring to make a lovely lavender shade. Pour the food colouring into the bag of rice and stir, stir, stir to distribute the colour. Lay out the rice to dry over night and your rice is ready. Easy peasy! To add an extra sensory element to our bedtime tub we added the flower heads from some lavender stalks. The rice has such a pleasant feel, as it’s soft and pours through your hands. With the added lavender it smells so relaxing too. You could add scoops and spoons and bowls for your children to play with the rice. Or hide some little treasures in the tub for them to hunt for. My kids didn’t even want to wait for me to add any extras – the colour, scent and feel of the rice was irresistible and they just had to play straight away. Oh fab tip Emma – thank you! This is how we do it, too!! Vicky, I keep playing with it myself every time I walk passed it! Does the colour come off on the children’s hands? Do you think that adding lavender essence would work to enhance the scent? Hi Clair. No, it didn’t come off on the children’s hands at all – but I think that will depend on which brand of food colouring you use. We use Silver Spoon Create colouring. You could add lavender essence but the scent was strong enough just from using the real lavender flower heads, so I don’t think you’d need it. I love this! Definitely putting this on my to do list! Glad you liked it Marnie. Can you leave the dye out? We have food due sensitivities. Yes Laurel, you sure could. You’ll obviously not have purple rice, but the white rice would look just as lovely. 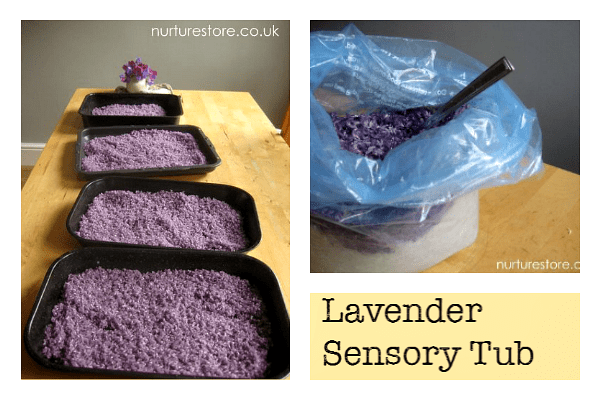 The fragrance comes from the lavender so the tub will still have lovely sensory qualities even without the colour. 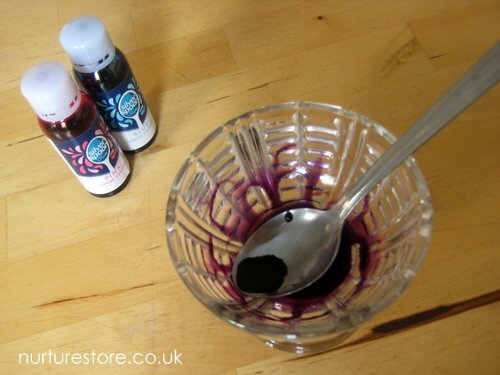 Use a tablespoon or two of alcohol with the coloring. I usually use watercolor paint (I think from S&S) and put it in zip lock bags to mix. Then spread it out on newspaper to dry. The alcohol helps the rice dry faster and it does not rub off on the children’s hands once it is dry. Love the idea of adding lavender. I always scent my play doh but never thought to scent rice!! How do you scent the play doh? 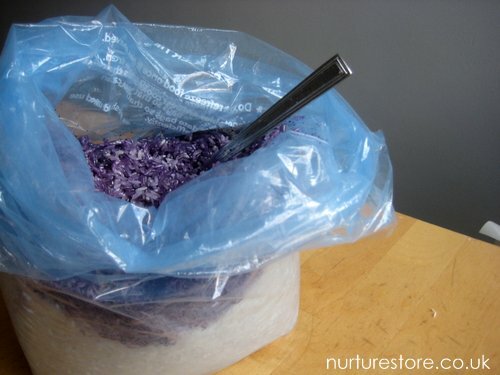 can the lavendar scent or buds be added to the diy microwavable rice packets? I’ve never used rice packets Sheila, but do the just contain ordinary rice? for the lavender cloud dough…can whole wheat flour be used instead of white flour? Hi Jessica. Cloud dough needs a specific kind of dough (cornflour/cornstarch) but I wonder if you mean the play dough I refer to in this article. You could make play dough with wholewheat flour, although if the flour has more ‘grain’ in it, you will notice a slight difference in texture. I’ve just made my lavender rice, it’s fab. One or two drops of lavender oil and the smell is just a hint. Perfect. I put it in sandwich bags after dyeing and put it in the freezer for ten minutes and it was dry and ready to go. Fab. Thanks for posting. Hi lee. No I wouldn’t let the rice go down the drain – it’s very likely to block it. Better to compost it? Where do you get the lavender flowers? Hi Mel. Ours were from our garden but you can also buy dried lavender online. Do I need to worry about the dye or lavender getting on little hands and getting in mouth? Yes Arolyn, I would always asses an activity in relation to the children who will be playing, considering things like what kind of dye you choose, if there are any allergies, and if any children are likely to put things in their mouth. Hi Tracy. That’s going to depend on the brand of food colouring you are using and how much rice you want to dye. Food colouring gels go a long way and you would only need a tiny bit for the bag of rice shown in the photograph. I used liquid food colour here and used 1-2 teaspoons for the bag of rice shown. Love this. Made some pink and red rice for valentines day last week. How long does it last? Ours lasts for months and months, if not years! So long as you don’t let it get wet or damp. I am a grandma of a almost 3 year old, He doesn’t play with any of this. I have tried flour, sand, whip cream. Any ideas? Hi Kim. It’s so nice to hear you’re giving your grandson all these lovely invitations to play. What does he love playing with? Perhaps start there, so you know he’ll be interested, and build from there. So if he loves cars, maybe add them to the sand tray, or roll the wheels through paint and show him how he can make some art.